The dashboard gives you a quick and easy overview of your financial performance. Laid out simply and cleanly you can spot risks before they become an issue. You can customise your dashboard and stay focused only on the indicators that matter most to you. Colour coded graphs and drill down capability help you understand in an instant what your short and longer term cashflow position is. IRIS Insight powerful 'What If' tool helps you to see the impact of changes on your business . If customers are taking longer to pay, costs are increasing or you want to expand - the what if tool will help you see the impact. 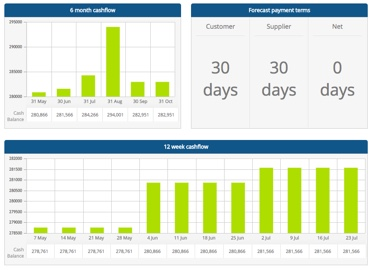 Produce fully integrated profit and loss, balance sheet and cashflow forecasts easily. No more battling with spreadsheets! Create financial forecasts in minutes, import historical data from your accounting system – forecasting and tracking has never been this easy. Produce a wide range of reports on the up to date financial position of your business. IRIS Insight also produces professional reports to meet the needs of banks, investors and other potential funders. Work online with your team and advisers. IRIS Insight is cloud based so you can share data and collaborate with your team and your investors in real time. No need for different spreadsheet versions being passed around.